So named because the trees all look like… sticks! Except for the softwoods of course, who shimmer with pride this time of year, their effervescent needles poking through the otherwise dreary palette of browns and grays. 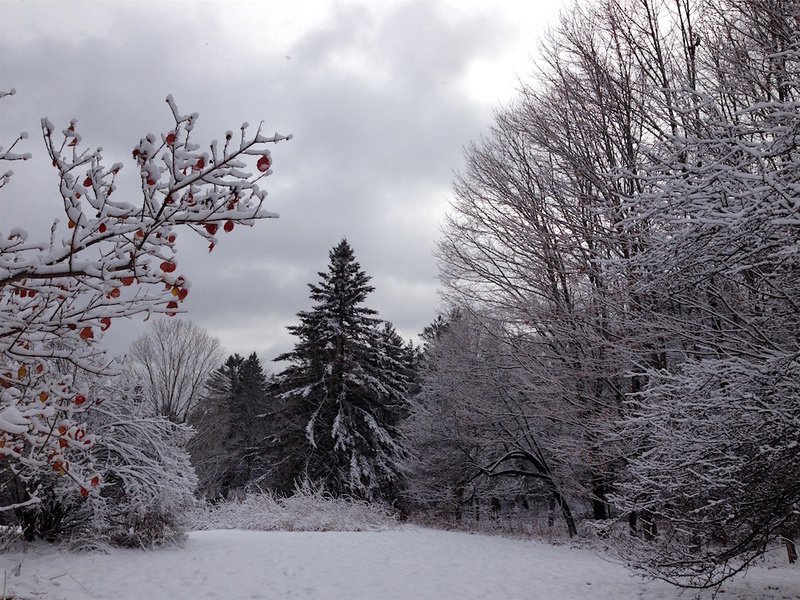 November also brought more regular snowfall and a gorgeously white Thanksgiving. Interestingly, as I write this, I’m staring out at a yard almost entirely devoid of snow. 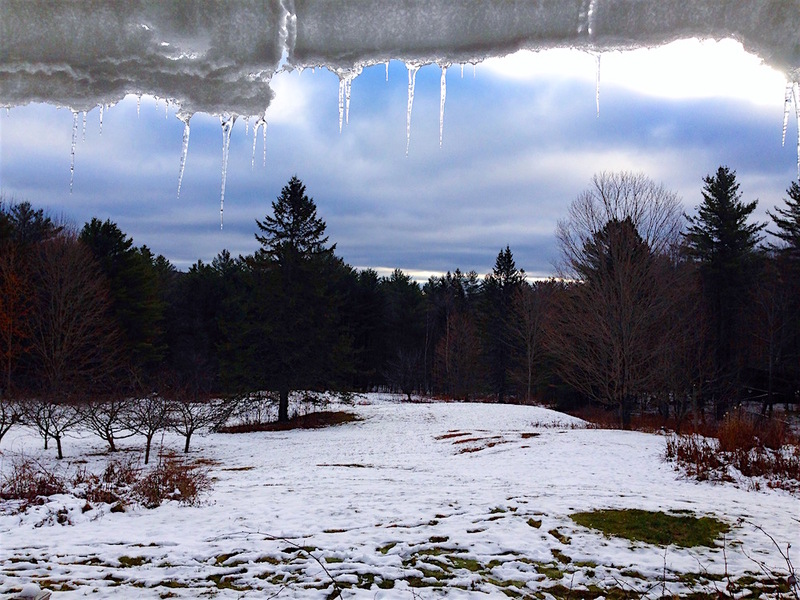 I assumed we wouldn’t see the grass again until spring, but how wrong I was to presume to know what nature intends. 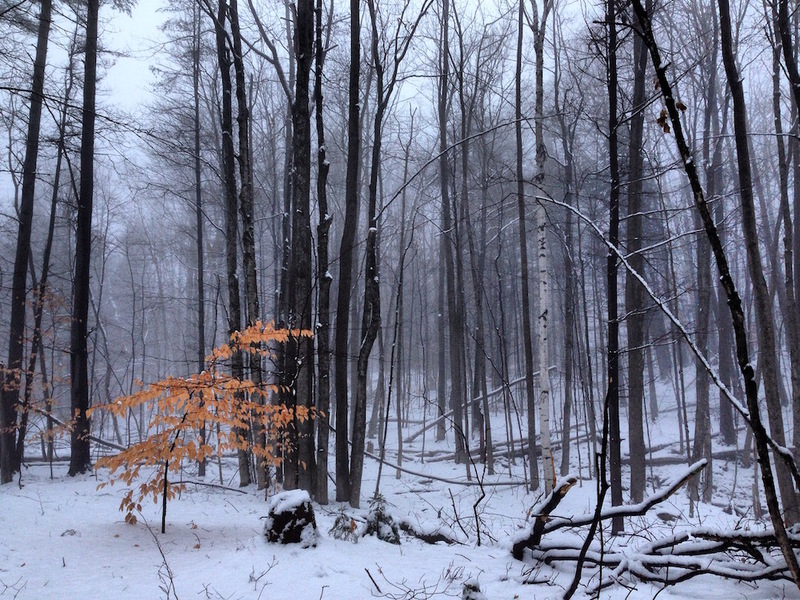 On a hike the other day through our snow-covered land, Mr. Frugalwoods and I remarked to each other that surely this must be the most beautiful season. It’s a gift to live somewhere that has a knack for year-round picturesque-ness. The riot of fall colors was stunning, but the simplicity of these stark wintertime trees is an equally divine balm for my frenetic mind. In what can only be described as a ridiculous example of city-meets-country, I started taking our hand-me-down Bugaboo stroller on our daily walks through the woods. I fully realize how ludicrous it seems to wheel a supremely expensive stroller–designed for posh sidewalks–through wooded trails, but it actually works pretty well. It can’t traverse our largest/rockiest hill, but for our flatter trails, it’s decent! I previously babywore (fancy way of saying ‘carried in a carrier’) Babywoods, but at one year old, she’s getting heaving on my back. I gotta tell you, I’ve carried this kid for a year and I’m ready to push a wheeled contraption. Plus, she loves looking out at the landscape from her stroller perch. The challenge now is finding something that’ll skim through the snow with ease. Try as it might, this stroller does not do snow. I have my frugal eye on the used market for this amazing stroller that converts from wheels to–wait for it–SKIS! Genius. I’m hoping one will show up on Craigslist for a reasonable price. Enjoying our property is a chief goal of ours and I don’t want baby conveyance issues to stand in our way of snowshoeing and winter hiking. Each month of this first year on our homestead, Mr. FW and I think of new things to turn our attention towards. We have a masterful grand plan in our minds of what our homestead might be in 5 years or 10 years’ time, but we’ve realized that these projects and these changes will come about slowly. As I discussed in depth last month, we find ourselves with more things undone than done and we’re learning the grace of accepting the limitations on our time. In November, I began the process of sourcing more of our food locally. And by locally, I mean hyper-locally. In Mr. FW’s terms, “it’s food that could’ve walked over to our house.” This quest, however, is not as straightforward as it seems. In the city, all I had to do was pop over to a farmer’s market, or sign up for a CSA, or hop on the ol’ internet. Out here, however? Affordable local food comes via word of mouth. There are several farm stands, which we’ve frequented, as well as a summertime local farmer’s market. But for everything else, we’re learning from the best source of all: our neighbors. This month, I managed to purchase ground beef from neighbors 3 miles away, hard cider from our neighbors who live 4 miles over, and a Thanksgiving turkey raised a mere 2 miles away. I’m pleased to report that the turkey made a simply divine Thanksgiving feast and that we ate every last bit. Mr. FW then made stock from the carcass and we fed the leftover tidbits to Frugal Hound. The cider also made an appearance on Thanksgiving and was met with universal approval. Truly delicious, and made by local people from local apples with local ingredients! Yay. I’m continuing my quest and hope to find local eggs, milk, and chicken next. We also learned this month that our very own land proffers quite a few edibles, thanks to a guided hike by one of our new friends who is an expert naturalist/wild forager. Who know you could eat so much stuff from the woods?! I’m well aware that approximately 45,097 of you will comment that “chickens are so easy to raise!!! !” and that we should raise them ourselves. I’ve heard this refrain 408,973 times and I imagine chickens will indeed come to roost with us someday. However. Mr. FW and I made an agreement (more like a marriage pact) before buying our homestead that–no matter how tempting–we wouldn’t take on any animals (farm or house) in our first year. We feel it would be unfair to us and the animals to subject them to our novice ministrations. Although I’m all for going at life full throttle–we did, after all, buy our homestead the week our first child was born–I’m also one for knowing my limitations. Therefore, I’m content to support my neighbors’ farm labors this year. Are you ready for this month’s wood lesson? I know I am! I’ve been so excited to tell you about this all month long. Could hardly contain myself. Because this month, we’re discussing where my strengths and wood overlap: organization!!! In previous months, I discussed the cycle of obtaining firewood from the trees on our land. 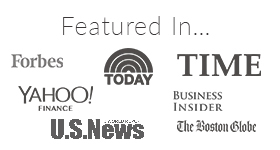 You can read all about how Mr. FW fells, bucks, skids, and splits wood. Now that we’re burning wood daily as our only heat source (read about our super efficient woodstove here), the organization and transportation of said wood is our chief wood-related concern. After splitting the wood into sections that fit in our stove (woe betides the wood splitter who does not first measure the stove and hence has wood that’s too long), Mr. FW stacked it into two long rows atop pallets (scavenged for free), covered by galvanized steel roofing (some scavenged, some purchased). The rationale for this method is that wood needs to dry or “season” before it is burned, and in order to dry, it needs sunshine and airflow. Hence, an enclosed space (such as a barn) is not conducive to seasoning wood. While these two long stacks–located between our house and barn–were ideal for the seasoning process, they’re not ideal for procuring daily wood… especially with several feet of snow on the ground. Our found object wood box, now with wheels! 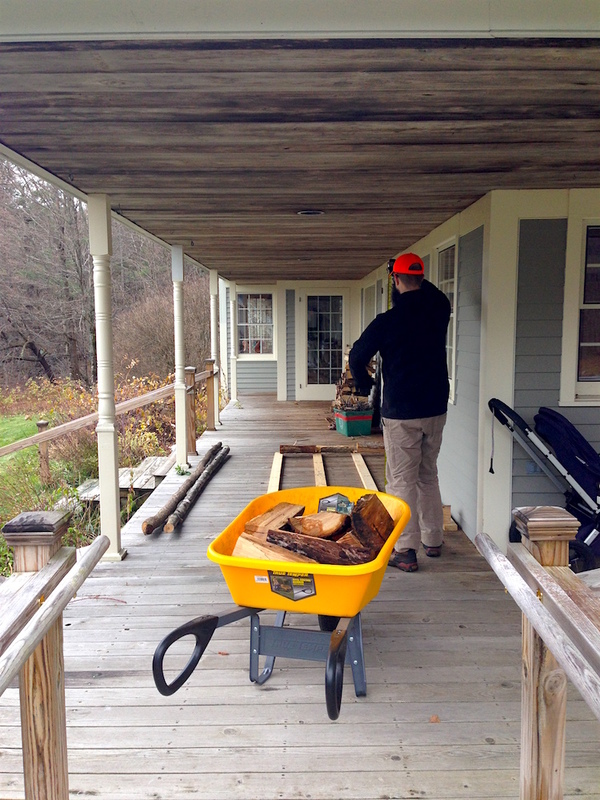 And so, Mr. FW built a wood rack for our back porch. We’re blessed with a wide, covered porch all along the back and side of our house, which is a premiere spot for wood to hang out prior to burning. On the porch, the wood is protected from snow and rain, gets good airflow, benefits from morning sunshine, and crucially, is adjacent to the house. Using leftover wood scavenged from around our property, he fashioned a rudimentary–but totally effective–wood rack that holds 1.5 cords of wood. The rest of our split wood remains out on the pallets in the yard and will be cycled in as needed. Being a planner, Mr. FW wisely stacked the wood from oldest to youngest since you want to burn your oldest–or most seasoned–wood first. Conveniently, we have French doors leading from our living room (where the woodstove is located) onto the porch (where the wood rack is located), which makes the wood path quite brief indeed. We originally considered storing dry wood in the basement, where there’s plenty of room, but were cautioned by neighbors that bugs living in the wood can reanimate when brought indoors and hence could populate our basement in droves. Eek. Since we don’t want to bring in just one or two logs at a time, the wood moves from the outside wood rack into our indoor wood box. Conveniently, this is an old box that we found in our barn–hey hey hey–and it looks like something Restoration Hardware would happily charge you $300 for. 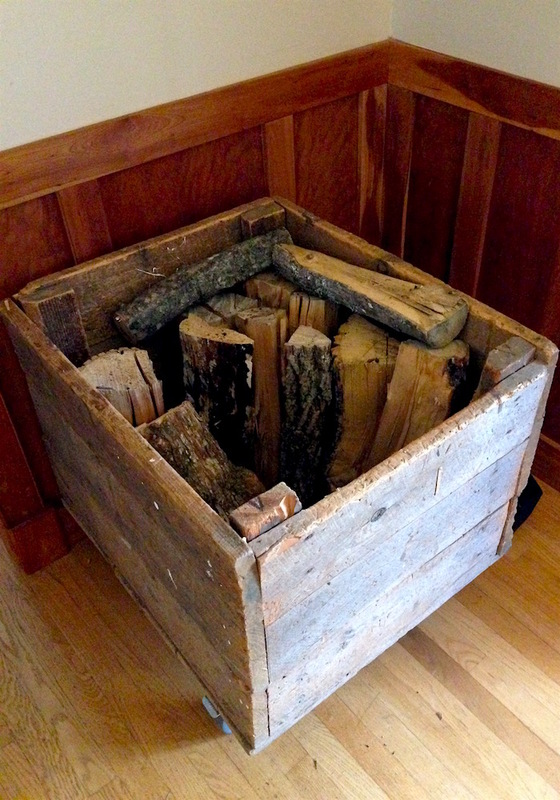 In addition to its rustic hipster look, our wood box has the benefit of holding 3-4 days’ worth of wood. Heck yes. The woodrack is on the porch just outside those French doors. Woodbox chillin at left. For a few weeks, Mr. FW toted wood using this handy wood tote (which looks like it would double as a greyhound tote, just saying). Then, a wise neighbor commented that one could simply affix wheels to one’s wood box and–presto–wheel a full wood box into the house in one fell swoop. Genius. Mr. FW ordered these casters, screwed them onto our free box, and is now rolling wood with ease. The wood box dwells in the corner next to the wood stove and from there, the wood makes its final progression into the stove (aided by Mr. FW’s hands, of course). 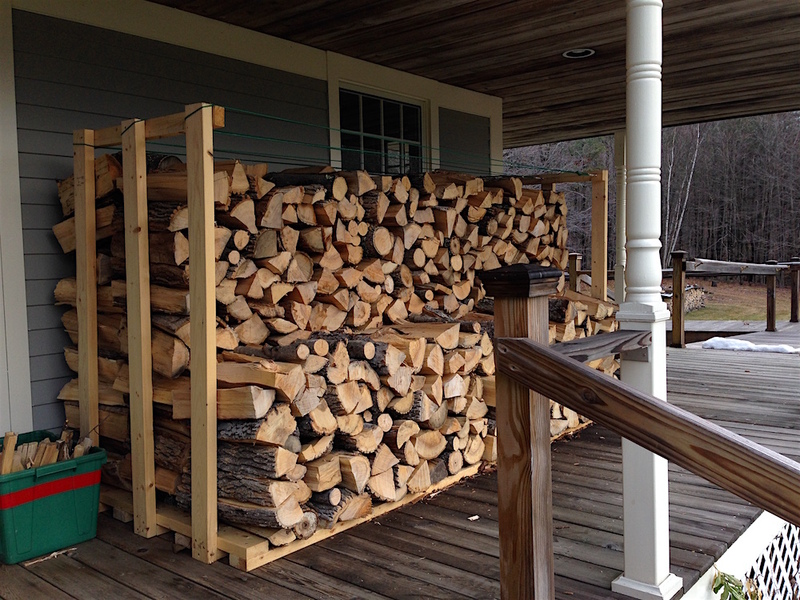 Huge thanks to our neighbors for all of their advice on how to store, stack, and transport our wood! Onward to December frugal comrades! How was November on your own personal homestead? I think it’s very wise to take things one step at a time. There is a learning curve and time commitment to every single task. I love jumping in and starting 100 projects, but with a homestead life, adding on slowly is a great idea. There is nothing like planting (then weeding) a 1 acre garden that first year to make you hate gardening. Your homestead can quickly become your full time job and squeeze out time for other things. I think a 5-10 plan is perfect! One word of advice as someone who also lives in a woods albeit more in the mid atlantic. Only keep that wood near your house in winter. It attracts termites and other wood bearing insects the rest of the year. It also can attract snakes. I was going to say something similar. (You did mean ‘wood EATING’, didn’t you?) But I was also warned about mice and other critters in the wood pile as well, especially since it is cozied up to the side of the house. I was always warned to keep it a bit further away. Putting the wood box on a hand truck would make it easier to take it nearer to a wood pile as well. Seconded! Keep it clear in non-heating months, maybe even take the rack down. Though I’m eyeing the ropes at the top as rainy spring/fall clothes drying space when there is little wood down below. We are in the process of gathering local wood for our newly installed cookstove. So we will be busy building a wood storage system ourselves. Thanks for the pics & our really like your indoor woodbox. It looks maneuverable and minimally messy. Plus, it gives us some ideas. Did you happen to take more pictures of the construction of the wood rack? I think I have a few more–are you hoping to build one? Mr. FW says he didn’t use a plan, he just used the lumber we had on hand. So glad you are buying local food. Yay! It is more expensive, but it is beneficial on so many levels, from the environment and food miles to supporting your local economy. Good luck with getting an awesome deal on that baby carriage that converts to a sled. I love the third picture! The remaining leaves seem to be decorations on a frosted Christmas tree! It is not our primary residence, but my husband and I own an off grid cabin in the mountains. A wood stove is our only source of heat. Pro tip: have Mr. Frugalwoods split some of the wood down further into small kindling <0.5" thick and small pieces <2-3" thick (full length or half length of the regular logs). We keep the kindling organized in a basket and the small pieces in a wooden crate. This means you are always prepared to light up a new fire! We do keep a large quantity of wood stacked inside, but the entire cabin freezes when unoccupied, which is often, so bugs are less of a concern. Yes! I neglected to mention our kindling :). Fortunately, we have tons of downed branches in our woods, so we collect that for kindling, which lives in a separate box along with our homemade fire starters (rolled up brown paper). Another great — and free — homemade firestarter is to stuff your leftover laundry lint into toilet paper tubes. Lint is definitely quite flammable! 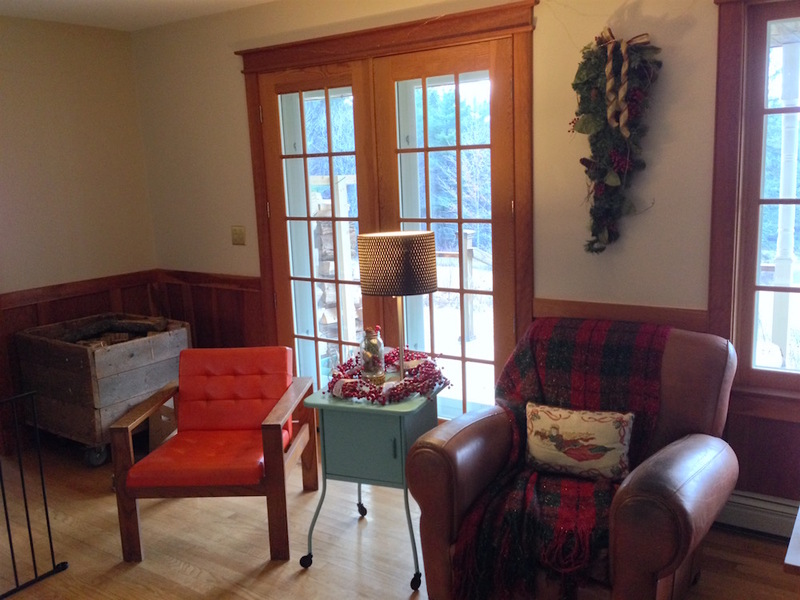 At our VT cabin we use dryer lint in paper egg cartons and then add melted wax from the livingroom candles. Just break off a couple of egg “cubes” and go. In our home I gather pine cones — free — and all year long save the unburned ends of candles, also “free”. In the fall I melt them all down and dip the pine cones in when the wax just begins to cool. What we don’t keep I put in baskets or clear bags and give as Christmas gifts to friends with fireplaces. I’m so hoping that you get that stroller on skis! That would be so cool! And it’s so smart of you to make a pact not to bite off even more projects (in the form of animals)! What my parents did in winter – they took a regular wooden sledge with backrest, put some blankets under and around us and whohoo – a perfect stroller in snow 🙂 The sledge did its work very well and could be used also in the future when we were older – maybe worth to try 🙂 In worst case, you can always buz the stroller you mention in your post. Same here! I was just going to suggest a sled of some sort. We pulled my daughter around the yard in it when she was 2ish. Not sure how far you’d want to go while pulling but it’s worth a try! And fun for the little one!! 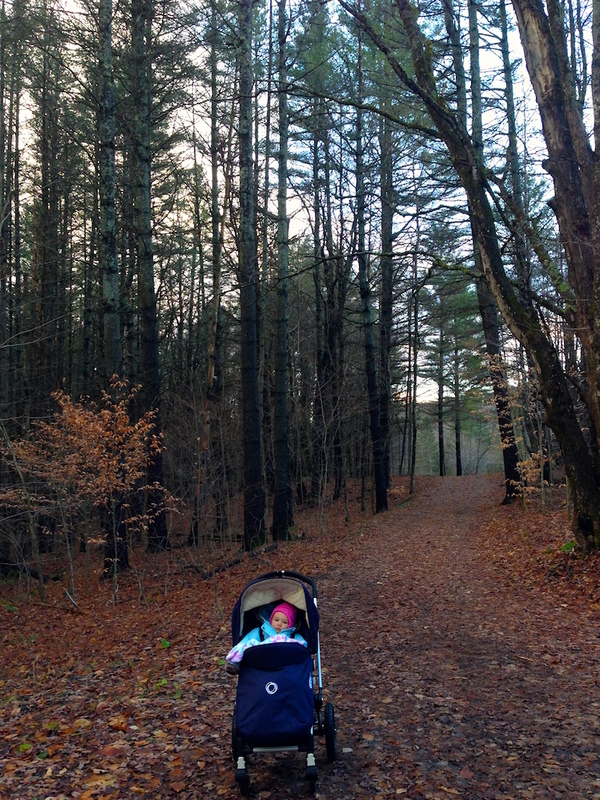 Have you tried a jogger stroller on the steeper trails? I had good luck with those especially if the tires were overinflated slightly. Might be easier to pick up used! The little sleigh stroller looks so cool though. Have you tried one of the frame backpack carriers, originally made famous by LLBean? Could be easier on the back although I found them difficult truthfully. Anyway love seeing your farm. By the way my favorite present to give right now is an instant pot…pressure cooker, slow cooker all in one and makes the best yogurt at like a quarter the price. My last othe trick. I making oatmeal once a week and putting it in mason jars for the week. Only one or to clean ! I have not tried a jogging stroller–but that ski stroller converts from jogging wheels to skis, so it’s my dream stroller 🙂 (but it’s super expensive!!!). We’ve tried her in a backpack, but she hated it and pulled our hair, so uh, not sure that’s going to work… but I might try it again now that she’s a bit older. Somehow I ended up on your blog a couple days ago and ever since I have been enjoying all your articles going backwards… and was so very delighted to find a new one, once I was done! I’m a little bit (or maybe a little bit more) jealous of you guys being able to live on a homestead in Vermont – this is my favorite state in the US and I’ve been dreaming about moving out of the city and back to the country for a while… probably not going to happen too soon though, sadly. Enjoy the winter. Looks lovely. When our oldest was little I bought a sled that had a seat he could be buckled into. I’d pull him around the property in it and we’d explore the trees. Since we lived in a cold weather climate that got a lot of snow I found several at yard sales. You may be able to find something like that on Craigslist. They’ve gotten fancier over the years and I’ve even seen some that are covered. I have seen babies happily transported on a sled with and apple box or milk crate attached to the sled. I also saw a homemade version of old skis screwed onto a wooden box, with a rope handle for towing. Baby happily rode in the box. You can put cushions and blankets in the box for comfort and support. As a VT mom of 3 kids, ages 6, 4 and 2, I highly recommend a Jet Sled. Sold at sporting goods stores, they are made for ice fishing but are the BEST at transporting kids. Other sleds designed for babies and toddlers would tip over when we were walking in the woods. They are big enough to hold multiple kids if needed and you can add blankets as needed to support a younger child. The back is also high enough to make a good backrest. As your kids get older, they are also great for sledding because the front is high,the sled is deep and they are comfortable for even adults to use. Totally agree with the Jet Sled. We found, here in AK, they work better than skis and work no matter how much or little snow you have. Also, they are rugged and outlast everything else. I never knew I would be so fascinated by wood. Thanks for the update! My uncle made a sled with a seat (for two!) for his two granddaughters when they were very little. They loved it. It was basically a box seat on a sled, as others have suggested. Do watch those little cheeks for wind chapping, though! I agree that first you need to see what a year on the homestead is like before introducing animals. Now is the time to think about what kind of winter protection chickens, goats, pigs, whatever will need. Summer is the time for figuring sourcing water and shade, that sort of thing. If you have bears, think about protection from them for your livestock. Be thoughtful as you observe your land and climate, listen to those neighbors, and you’ll start out very well! Loved this post! Maybe I’m miss reading this and being dense this morning, but I think you meant to say that Mr. FW stacked the wood from youngest (on the bottom of the pile) to Oldest (easiest to reach on the top of the pile), not oldest to youngest. Oh I see what you mean :)! What I was referring to is that he stacked oldest at one end of the long pile and then down to youngest at the other end. Oh, that works! Thanks for responding. We have been working on our 1 acre homestead for about 5 years and should have it paid off in about 5 more years. We make less then $50,000 a year, my husband is a very handy man and can fix just about anything, thank goodness! We have 3 boys and they eat a LOT! We raise pigs and meat birds which we slaughter ourselves to save money. We also have laying hens. Our goal is to grow all our own food. We built a greenhouse a couple years ago and use it all year long. I can start beans and greens amazingly early with extra row covers in the greenhouse, we also have greens for salad for most of the winter except the coldest season which seems to be January. We live in the mid coast region of Maine and we are able to harvest clams and mussels locally for free. We are able to glee a lot of apples in the neighborhood for Apple sauce and storage. Storage is a problem for us right now, we have a horrible basement for storing food. If you haven’t read the book Four Season Harvest yet, you should! I was wondering what kind of cell carrier you use. This is our biggest bill and we would like a reliable inexpensive carrier. 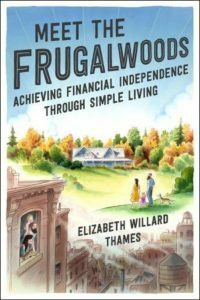 I love your blog, way to go Frugalwoods! When working on a homestead it’s incredible how fast your time flies. I thought I would get tons of projects done after leaving my job, but even with another 40 hours a week there is only so much you can get done in a day. We have also been heating our home with the wood I cut and split over the summer. I keep a similar amount – about 1.5 cords – in my garage. My neighbor gave me the same warning about bugs like termites, and he keeps his on his porch. But termites live in dirt and eating rotting wood, neither of which are found in my garage. I still keep an eye out and there have been some bugs, but mostly spiders who likely eat any other pests. Generally though it’s been much more convenient since I can fetch my wood in my pajamas, and I haven’t had any bug issues so far. Enjoy your wood stove, there is just something about heating with the fuel you got yourself! Nice wood process FrugalWoods. I bet your home is warm and toasty! If your tractor has a pallet fork attachment, that’s going to be your easiest way to move large quantities of wood up from the barn. My father (who’s nearly 80) does it this way. He puts everything on pallets (even firewood) so there’s no carrying around. Yep, we load the wood into the tractor bucket, proving that tractors are great for everything :)! I sooo wanted that stroller with skis but couldnt find one for a price I was willing to spend. We ended up getting an inexpensice plastic sled that we attached a rope to and pulled the kiddos on when out snow shoeing. And when you find a nice hill you can all hop on and ride down. I envy a lot of what you’re doing with the homestead. That really sounds fun, different, and really, an altogether better lifestyle (although I’d guess not everyone would agree). It’s interesting to learn along with you on how to best do things. It’s funny how something at stupid as putting wheels on the wood crate is something that just slips on by until someone like your neighbor tosses that idea out there… genius! Also for eggs, milk, and chickens, do you have a local town Facebook page? People post on our’s regularly with eggs offerings. Most CSAs have a partnership with a local farm for eggs and you can ask them where they get them from for the winter. Chickens seem too complicated to me from those I know who’ve raised them in small groups. They are often victims of foxes in the suburbs so the wilds of VT seem worse! That’s a great idea! You should start a town Facebook group if there isn’t already one. Might be a good place to trade items or start playgroups. Great pics, as usual. I really loved the part about locally, like just down your main road locally, sourced holiday food. That has to taste great and bring you closer with your neighbors. A stroller that converts to skis??? That is freaking awesome! I never thought about getting a kiddo around in the snow (snow in Texas? Ha! ), but that does seem like a neat fix. I absolutely adore your hyper-local eating. It sounds just like the life we’d like to lead in the coming years! Also, can I just compliment you on how gorgeous everything is at your house?? It all looks great! 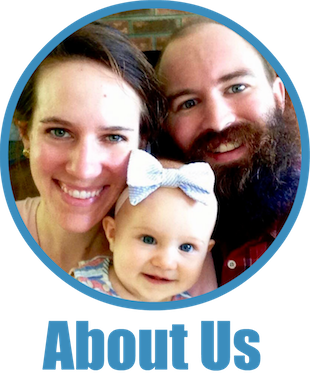 This month on our comparatively small homestead, we gained an animal! We adopted a kitten we named Zap and we’ve had him almost a week now. I’ve been a little down in the dumps since Frugal Hamster passed away in September, and Zap is just the bolt of joy we needed around the house. I just wanted to comment, too, about the wood so close to the house. I’m no expert, and we use propane for our heat, but think about termites and insects that get into the wood, and, possibly, into your house. Just a thought you might want to look into. Hopefully, you’ll prove me wrong, but I know it’s happened in the past. So glad you’re enjoying your property and your new home. I wish I lived near enough to buy your stroller when Babywoods is finished with it. My senior beagle, Daisy, needs a ride and pet strollers are way too expensive. Mr Frugalwoods has done an awesome job with the wood! I burnt wood for over 20 years and stored it in the basement with very very few bugs. We didn’t bring in any punky (starting to rot) wood. It is so much easier to not have to be doing it with the snow and ice of winter! Food Co Ops in Vermont – https://coopvt.wordpress.com/vt-co-op-directory/ Noticed one in Battleboro. Yes, there are a number of great co-ops in VT–unfortunately, the one in Brattleboro is not close to us. Good stuff, I am in year two of a battle with the ever disappearing wood pile at our Vt cabin and have committed myself to making next Summer the ‘Summer of Wood’ (stockpiling that is). BTW: nice wood box ! Yes, Misters definitely babywear! My problem is that Babywoods and I often take a walk alone together in the afternoon. Thank you for that link! Those look like something Mr. FW could rig up :). A jogging stroller works wonders! I pushed my little grandson around all winter in piles of snow, with the greatest of ease, in one of these! I think it’s very wise to not take on animals your first year-I’m sure there’s so much to learn, you wouldn’t want to overwhelm yourselves. For local food, even though we live in the suburbs of CT I’m able to get some things from farms that are literally up the street. The only downside I’ve found is that they don’t have fruits or veggies in the winter (which makes sense-in CT those things don’t grow in the winter). At a minimum we can get fresh local apples, apple cider, eggs, and meat through the winter. Huge 9 alarm fire in Inman sq area. Is your rental ok? I think it’s Berkshire st. Yes, fortunately our tenants are safe. Horrifyingly huge fire, though. Thoughts and prayers for all the families who are displaced. I rolled my eyes and thought “who could this possibly make sense for”–shows what I know! I know a couple of families here in Colorado that have strollers with skis – their brand is Chariot, and I’ve seen some on Craigslist here. Usually they are still quite expensive, though. Chariots and Bobs seem to really hold value. Fun post! I love your site, Mrs. FW. For hauling babies in winter–this old ski instructor would tell you, just get a cheap plastic sled (and maybe attach a longer pull rope loop on it); you will never hear said baby giggle and chortle more than when she is being pulled in jagged fits and starts over the snow in that sled (plus, in the summer, it makes a great container to put weeds in when you are kneeling by the flower beds pulling weeds, FWIW). We heated withe wood for years, and winter-stored it on our porch just ad you are doing (be careful about piling it in front of windows, though). The rest of the year, when we were in fathering/stacking mode, we kept our “backlog” (!) in an old shed with no door. The wood seasoned and cured just fine, and was much easier to get than trying to dig it out of the snow in the winter. Enjoy–it really is the best, warmest heat there is! That Mr. Frugalwoods is a handy one, isn’t he? 🙂 I love/hate those snow pictures you post. Love seeing them and hate thinking about dealing with all that cold, frozen stuff. 🙂 It’s still shorts weather down here (barely) and we’re spending half of December in the Caribbean on cruises so won’t have to experience much “real” cold till the end of the month or January. Please keep that white stuff up north for as long as possible. I love this series, it gives me joy and confidence that a modern life “in the woods” is not only a possible option, it simply is the best option! Btw, pictures in this post are the best I’ve seen in your blog so far. amazing! We do have a Thule that we use for cycling and running (not that much snow where we live in the city). At first we were also put off by the price. In the end we got one for a special deal and feel it’s well worth the money. They are durable, comply with high safety standards, work for a comparably higher weight range and we hope will last us through all our children. The extensions are easy to put on, take off. It gives us a lot of freedom to get around by bike (and go car-free in the city), do shopping weekly again, I can exercise with children – all things we value very much.